The darkening was now more rapid, more dramatic. The sky was so blue it was almost purple. Behind the temple there was a reddening of the sky as the Moon's shadow approached at over 800 metres per second. We flew from London to Istanbul, arriving in the city just before 10pm, local time. Being lazy, I had booked a transfer to our guest house, the Naima Palace, located a few metres from the centre of the old city. 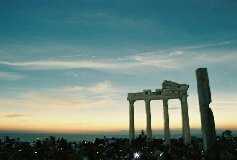 The first three days we explored the old city visiting sites like Aghia Sophia, the Blue Mosque and the Topkapi Palace home of the Ottoman Sultans. Being used to sitting at a desk all day meant that my muscles ached at the end of each day. The food was superb - meat balls and bean salad being a particular favourite. All washed down with either a yoghurt drink (ayran) or a fruit juice. The sweets were, well, very sweet - just the way I like them. Paklava, kadeif and all the other favourites. The soups were also nice - usually lentils. A hot soup went down well as it was cold in late March. We also visited unusual places like the Basillica Cistern, a huge cavernous area dating from Byzantine times with hundreds of pillars holding up a brick roof. Water was dripping from the roof as we wandered through. At the Galata Bridge we enjoyed grilled fish in a sandwich looking out over the Golden Horn - where Europe meets Asia. Dried fruit and nuts were bought in the Spice Bazaar, the pistachios are particularly good. Horror! On the first day, one of my cameras broke and would not wind on the film. Luckily, a repair shop sorted out the problem for seventeen pounds. Peter Hill was on a camping safari with me in 2002 when we saw the eclipse in Botswana. He cleverly planned to arrive a day after us so we had a chance to work out where everything was in the city. Even here we began meeting people who were in Turkey for the eclipse. 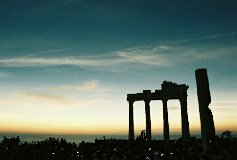 Turkey is an easy country in which to to travel: people are friendly, food is good and transport is efficient. The few words of the language I remember from my first visit 20 years ago came in useful. The Persian New Year was celebrated on 21 March. The Kurds had a festival and we got to see some dancing and colourful costumes outside Aghia Sophia. The bus journey to Antalya took 13 hours. The service was good - tea, coffee, water and cologne on tap and frequent stops for tasty food (I had stuffed peppers and meatballs with some delicious rice pudding). Antalya was smaller and sunnier but it was getting cold at night. Our guest house, the Sabah Pension, had a lovely courtyard where I could bore people about the eclipse. The weather forecast was cloud and some rain over the weekend but brightening up for the following (eclipse) week. Antalya is a pleasant city with lots to do and see. The weather was cloudy with sun breaking through. We visited Side, our first choice site for the eclipse. This was a coastal town with ancient ruins scattered around a tacky resort town. Crucially, it is close to the centre line and lies away from cloud-producing mountains. We thought that the Greek Temple of Apollo by the harbour would make an excellent observation site. The only concern was that many others would think the same. A car provided by the guest house drove us to Termessos, a Pissidian city in the mountains. The views were superb and the stonework outstanding. The city resisted Alexander the Great and the Romans. On the way back we bought some fruit: fragrant apples, sweet oranges and bananas. 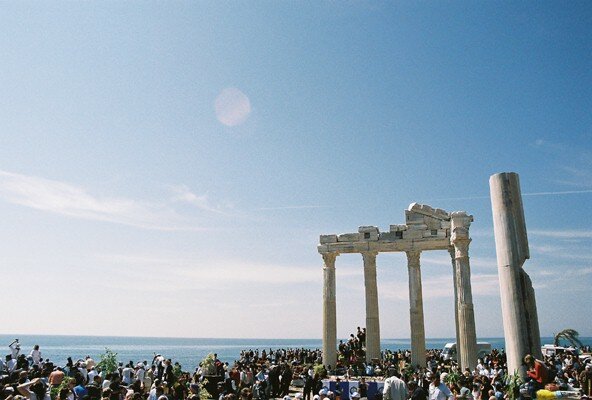 We took a bus for the 18 km to the ancient city of Perge. Roman and Greek gates led to a colonnaded street and an agora. The acropolis towered above all and I scampered up to the top for great views. All the conversation was about clouds and weather - a bit like an English bus queue. Many people were now turning up - eclipse glasses were on sale everywhere and after a week of looking I found my first eclipse t-shirts. Food continued to be good - I had a chicken casserole with the excellent, straight-out-of-the-oven lavash bread which is thin and crispy and covered with sesame seeds. The day before the eclipse, we prepared our equipment for the big day - lenses, cameras, spare batteries, mylar (for solar protection during the partial phases), nuts, fruit, sun hats, maps, GPS, etc. Everything was ready - the weather forecast was good. The alarm went off at 5:30. It was early and I had slept well but I was instantly awake. Outside it was dark and the windows were moist, a sign of clear skies. Jupiter and Venus were both visible as we got dressed and picked up our bags. Talaat and I shared a taxi with Peter and Richard Bellia (whom I met in India for the 1995 eclipse in India). It was a clear high pressure sky with tiny wisps of cloud as we sped the 70 km eastwards towards the centre line. The orange Sun came up over the mountains. The roads were clear and we made good progress. After an hour we arrived in Side, just five kilometres from the centre line. 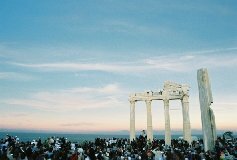 We walked a hundred metres to the four-columned Temple of Apollo to find a hive of activity from television companies setting up their equipment. To our left was a line of vans topped with satellites dishes. We clambered up some Byzantine ruins that overlooked the temple but were above the expected crowds. We had an extensive sea horizon. We noted a stage in front of the temple. Music began playing through a sound system. Two large groups arrived, one Spanish, the other Slovak. They joined people already there who were setting up everything from large telescopes to cameras. As the crowds built up, Richard decided to go to a quieter place. We decided to stay. Talaat and I had seen many quiet eclipses and I was enjoying the atmosphere and the people watching. Four friends arrived shortly afterwards. Janet Ha and Dan Huddle had also been at the 2002 eclipse. We had met Mari von Hoffmann and Bonnie Leifer in Estonia in 2005. When we told them about the eclipse, they told us that they would be in Egypt at that time. They had travelled through Jordan and Syria to find us. We were joined by a Dutch couple, Lex and Trinette. We were now nine and we settled our space with our bags and cameras as the crowds built up below us and behind us. 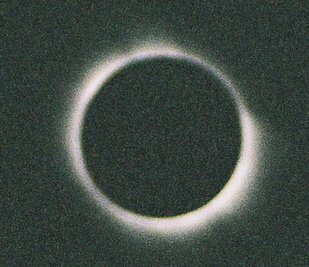 An Indian cameraman from the Salford Astronomical Society came and interviewed me - it turned out that I was the record holder for number of eclipses seen in the area. A small string orchestra mounted the stage and began playing Mozart. It reminded me of the Titanic and I had a vision of the Side peninsula slowly tilting and sinking. The Minister of Culture arrived with about thirty sunglass-wearing minders, military people and dignitaries. Shortly afterwards, beer and food were available free. We were also given fridge magnets and posters. Tack at its best and I was loving it. It was now hot and my arms were becoming red. First contact at 12:38 brought whoops of joy and a ripple of applause from the masses gathered below. It took me over a minute to see the bite out of the Sun. For the next half hour more and more of the Sun was "bitten" away. No changes were visible. The sea was a sparkling blue. Boats passed and there was even a water skier. Some light planes flew past. As 50% of the Sun disappeared behind the Moon the light began to become more golden and mellow and there was a noticeable lowering of the temperature. The harshness of the midday Sun was being lost. The sky turned bluer and this contrasted with the white whispy clouds. The sea had lost its sparkle and was a dull blue. The orchestra continues its gentle playing. The sky turned a deeper blue as 10% of the Sun was left. The crowd were quieter now. Some thin clouds appeared close to the Sun and they had a halo on them. Venus appeared five minutes before totality. The darkening was now more rapid, more dramatic. The sky was so blue it was almost purple. Behind the temple there was a reddening of the sky as the Moon's shadow approached at over 800 metres per second. Finally the last bit of the Sun was hiding behind the Moon - I recognised the light as belonging to a diamond ring. I looked up in time to see this point of light disappear. The corona flashed into view, brilliant and full of streamers at opposite ends. 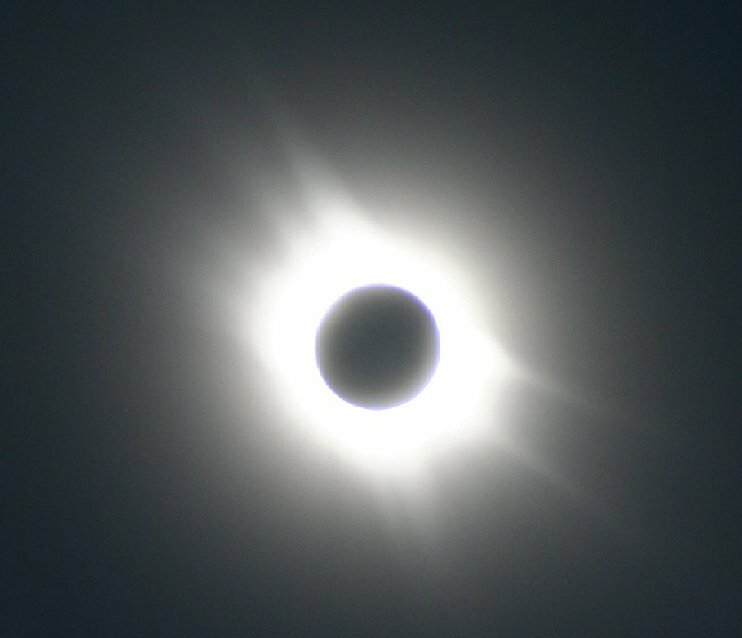 This was the brightest corona I had ever seen. Talaat saw a small bird roosting on the temple and a flock of birds flying inland. The sky above was as dark as late twilight. All around the horizon, the sky was yellow and red. Venus was gleaming white just behind the temple. I quickly looked for Mercury (between Venus and the Sun) but couldn't see it as it was too faint. My gaze was drawn back to that magnificent corona - thick bright and streaming. Talaat saw pink coloured prominences through binocculars but with the naked eye the corona was too bright. The 3m 45s of totality passed all too quickly - it always does- and soon the sky was brightening up behind the temple. Distant clouds turned from grey to white. I could sense the shadow moving over us at high speed. 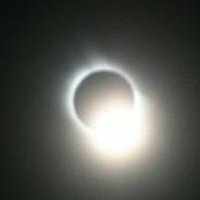 A broad diamond ring appeared which lit up the sky and it was all over. Applause rang around. Everybody had enjoyed the eclipse seeing different things. Lex told me he had cried. Mari said she had fulfilled an ambition and didn't want to leave until the very end. The Turks left quickly. We lingered - we savoured. Some of our group were interviewed by a TV station. I said nice things about Turkey and showed off using my Turkish only to find out it was a Russian TV station. We slowly packed up. I bought a t-shirt before a minbus took us to nearby Manavgat where we ate and chatted. We all separated as most of the group were staying in Side. The bus back was packed and I stood all the way to Antalya. Back at our hotel, the previously uninterested staff were crowding round me asking questions. We all compared notes - it had been a good eclipse. 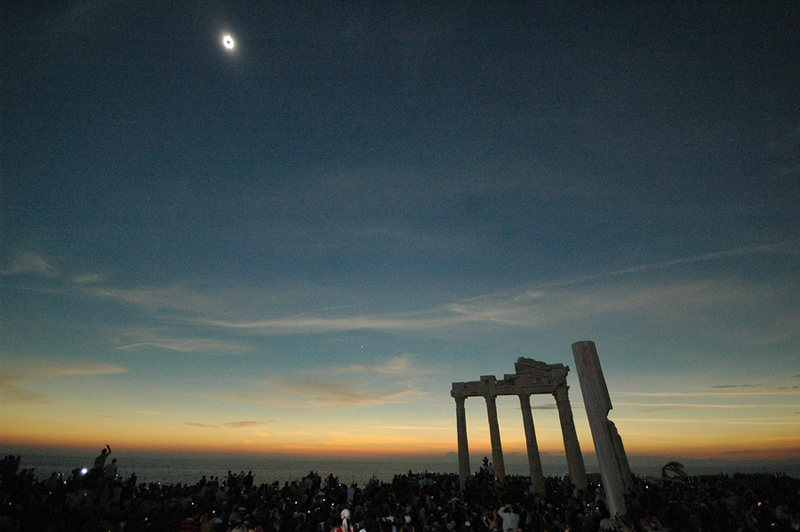 Totality at Side with the Temple of Apollo. It is just after 13:55 local time. The magnificent corona with streamers. Close up of the coronal streamers. 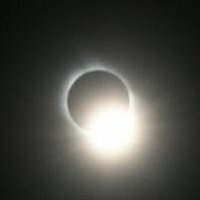 13:58 Totality ends with the diamond ring. 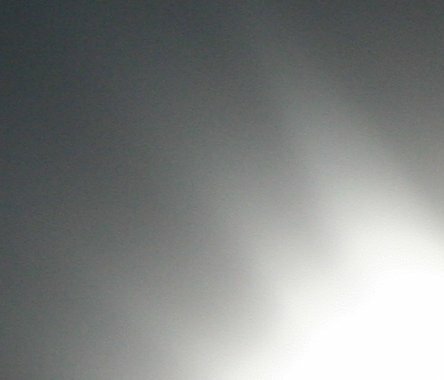 Different exposures of the corona with a hand-held camera. 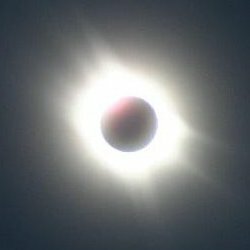 Video clips before, during and after totality. The days after the eclipse were spent sitting around the guest house courtyard talking to people about what we had seen the previous day. People had seen different things: birds roosting, night beetles coming out, mountains brightening as totality ended. One eagle-eyed person even spotted Mercury. 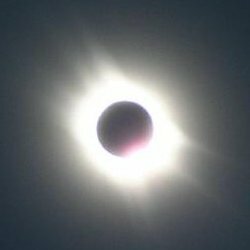 Another, unluckier observer spent much of totality driving around mountain roads to find a clear patch in the sky. Apart from a visit to Antalya's interesting museum (with its carved sarcophagi) all we did was eat, drink, talk and read the newspapers. Our final day was spent on body maintenance. First I had a haircut and beard trim. Half way through, the barber wanted a cigarette so we all had a tea break, finishing after our refreshment. Then I treated myself to a hamam (Turkish bath). I arrived at the 500 year old Seljuk building and was shown into a booth where I undressed and covered myself with a sarong. Being a wimp I put my swimming trunks on underneath. I was led into a hot steam room where I sweated the Moon's shadow and dust out of my pores. I slooshed myself with water from hot and cold taps while the steam did its work. A large burly Turk (who looked like an ex-weight-lifter) grunted at me and indicated the hot slab in the centre of the room. I lay face down. Water was thrown at me. I was then scrubbed with a pair of gloves that felt like a cat's tongue. This removed dead cells and skin and was accompanied by frequent slooshing. I was made to turn over for the same treatment. After being led to the taps for a further slooshing I was ordered back to the slab for a soapy massage. My muscles were stretched, pounded, kneaded and pushed. I felt like a piece of meat being tenderised for the grill. More slooshing and I was led into another chamber where I was covered with so many towels, I looked like a sheikh. More tea while I dried off. All the stresses and strains of the previous few days ("will it be clear? ", "will the roads be blocked? ", "will the camera work?") had been eased away. My skin felt smooth, my muscles relaxed. It was time for another kebab - an Iskender this time - slices of donner laid over thick bread and covered with a spicy tomato sauce and yoghurt. After a little shopping, the final act was the packing and the goodbyes. The journey home took 13 hours - a flight to Istanbul followed by another to London. After negotiating the tube and London's Saturday night traffic, I needed another Turkish bath. Written account and all text descriptions. (© 2006, 2009). All programming, photo and video editing. Wide angle panorama of eclipse site during totality using a Nikon D70S digital camera with Sigma 10-20mm D zoom lens. Views of Mercury and Venus extracted by cropping in Paintshop Pro. Partial and total phases, corona and diamond ring on Canon Powershot SD300 digital camera. Partial phases with mylar sheet on lens. Group photo and general photos during eclipse. Video clips. Sequence with temple on a Minolta X-700 (kindly loaned by John Mears) with 200 ASA Fuji film and 28mm lens set up on a small tripod. Individual group members and photo extracts (Adobe Photoshop) on Olympus OM2 with 50mm lens. 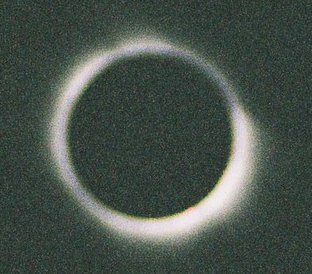 Close up photos of eclipsed Sun on hand held Olympus OM2N with 210mm lens with x2 convertor at 1/1000th second. "Bad" photos taken with camera set to automatic. All with 800 ASA Fuji film. Many thanks to Sabah Pension in Antalya for accommodation and transport. The 2006 eclipse main page. Maps of the path of the 2006 eclipse from Fred Espenak and eclipse details at the observation site. Venus and Mercury were both photographed during the eclipse. 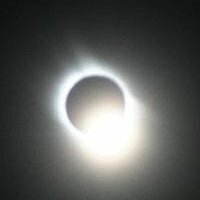 Accounts, comments and photos from or about the 2006 eclipse sent to this web site are reproduced here. People from the 2006 eclipse. Turkish newspapers from the 2006 eclipse.